Brødrene Aa, a builder in Norway that more recently has delivered out high-speed passenger vessels, has completed the carbon composite hull and superstructure for the new 48m Palmer Johnson Super Sport yacht. 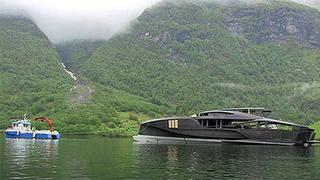 The U.S.-based Palmer Johnson announced the new SuperSport series last year at the Monaco Yacht Show. The new yacht features an innovative wave-piercing monohull design. The structure is now being shipped to Palmer Johnson's U.S. yard for outfitting and finishing. Brødrene Aa reports that building the highly complex Super Sport structure was a challenge, requiring accuracy in mould construction and high competence in vacuum infusion. 'We were honored to get this contract from Palmer Johnson in the first place, and I am sure this project has further improved our competence in carbon fiber boat production,' says Brødrene Aa managing director Tor Øyvin Aa.